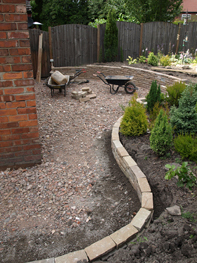 The rockery on the photo (right) sloped down to a patio which was made up of York stone crazy-paving. 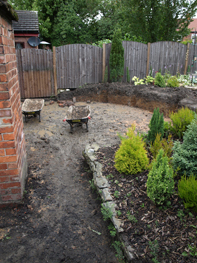 As the patio area was relatively small we decided to dig out the whole of the rockery and then build a retaining wall to hold the main level of the garden back. In line with Annette's (AF Garden Solutions) thoughts of not having straight lines she suggested that the retaining wall be curved and that the steps should also be replaced – again with a curve. We asked someone to have a look but he said that there wasn't enough space to do a curved wall! Thankfully, we decided to wait for this to be done and to concentrate on the garden itself first. The photo below shows whether a curved wall can be done or not! 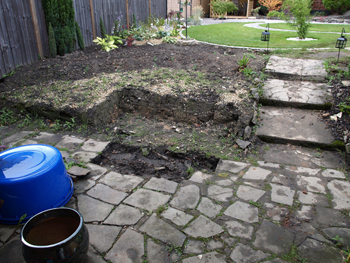 As we had started to dig out for a koi pond we were hiring several skips for the soil and clay that was being dug out. At the same time we started digging out the rockery to top up the skips. We then got two quotes from professional companies to do the patio, steps and retaining wall. The first company brought their portfolio and also showed us samples of different stone. Mark, the owner, also said that he could arrange for us to look at any of the work he had already done. He then took every possible measurement imaginable and, even rang us up later that evening to check on one of the measurements. He e-mailed us a quote giving us a full breakdown and listed exactly what he was going to do. As soon as he walked into the garden he simply said "wow, I wasn't expecting to see that". The second company came and made no comment on the garden whatsoever, nor did he bring his portfolio. He asked us what the measurements were and how many flags we would need! He only took two measurements and duly sent us a text message with just two figures on - one for materials and one for labour – no details of exactly what he was going to do. Needless to say, the first company - Beautiful Paving - got the job! 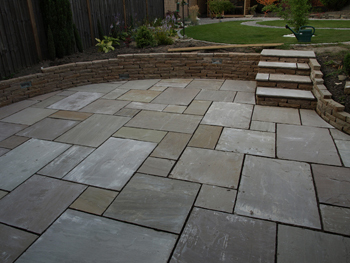 We opted for Indian stone for the patio and also decided to have the retaining wall in Indian stone. 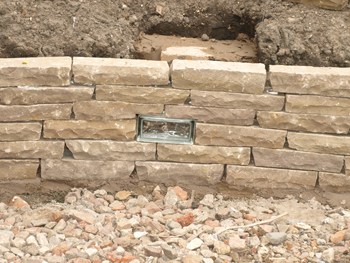 Instead of cementing the bricks together, Beautiful Paving suggested that we have them glued as it would give the appearance of a semi-dry-stone wall. Kath (my sister-in-law) had originally suggested that we have lights set into the retaining wall. We managed to source some glass bricks from B&Q and then put a pond light at the back of each one to shine through. As we didn't want it to be over-the-top we decided to just have three lights – each sited at a different height in the wall. the photo to the right) which was going to be dismantled and then rebuilt but, of course, this time it would be curved to blend in with all the other curves throughout the garden! However, the night before it was due to be done I decided that it wouldn't look right and so we asked for the wall to be done in Indian stone instead to blend in with the retaining wall and the steps. Once it was all done (left photo), everyone agreed that it was one of my better ideas! From the photo at the top of this page to the one below it took Beautiful Paving exactly eight days to complete in July 2011. They did a fantastic job and we would thoroughly recommend them – Mark is a perfectionist. He also checked, all the way through, whether we were happy with each stage of progress. For a complete look at the building of the patio, retaining wall and steps please have a look at The Patio Album! 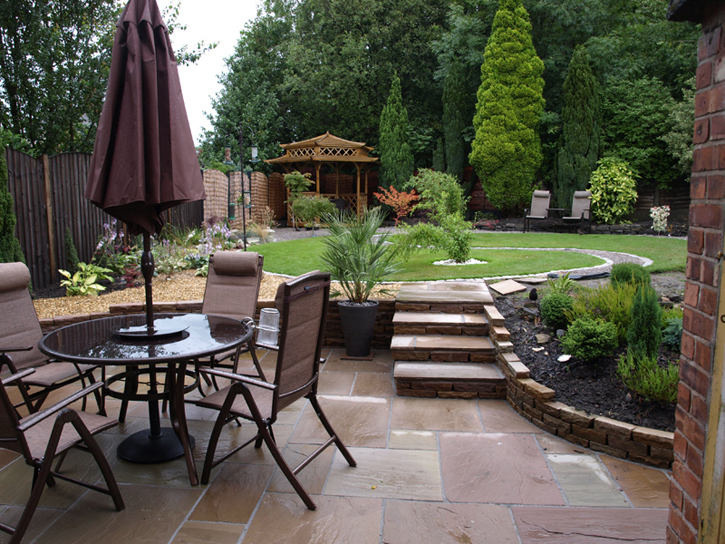 We had intended to clean the patio in 2012, using a Karcher, but just didn't get round to it! In April 2013 we decided to get Cheshire Drive Clean to clean the patio, the walls round the patio and the steps. We hadn't realised, until the job was done, just how bad it was! They cleaned it again in April 2014 and it still looks as good as new!